Hope you’re having a happy Saturday. Had lovely morning with my niece & now home & getting ready for drinks party I’m hosting tonight. But before I get to that, today’s #saturdayshopping column is dedicated to #handbags under £500. Hope you like my pick of 5 to follow. Paul’s Boutique Bridget Satchel via @ASOS http://t.co/7fwIHU8j – Ostrich effect & leopard print lining. Exotic @ £70. Urban Code Leather Shoulder Bag from @ASOS http://t.co/kgSYv1ZF – Also available in seasonal colour turquoise. Urban style @ £189. French Connection Isla Leather Shopper from @fc_woman http://t.co/8DE3WlCZ – La Isla bonita @ £250. Anya Hindmarch @anyahindmarch Navy Maeve Shoulder Bag http://t.co/pMuRevi5 – Almost royalty with signature bow design @ £450. 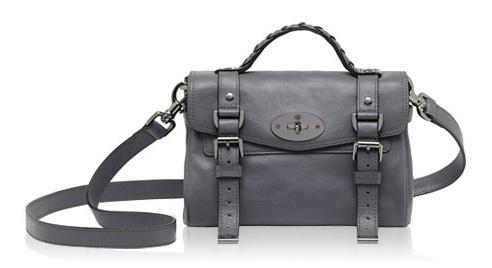 @Mulberry_Editor Mini Alexa Foggy Grey Soft Buffalo http://t.co/4iTOt0bL – Nothing dull about this grey bag @ £550.